“The Opioid Crisis Isn’t White”: How the Lethal Epidemic Affects Communities of Color | Democracy Now! "The Opioid Crisis Isn't White"
ABDULLAH SHIHIPAR: Yeah. So, the opioid crisis traditionally is considered to be white, because people are looking at, largely, the total numbers, which no one would deny that mostly white Americans are dying of overdose from opioids. It’s about 78 percent. But especially in the last few years, if you look at the rates of increase of opioid overdose death rates, we find that especially black Americans have had a stark increase in the death rates compared to other groups—in fact, more than white Americans. Since 2015, if you compare the rates of increase from 2015 to 2017, it’s almost doubled. So, essentially, the opioid crisis, we tend to look at it as a white problem, but when you scratch beneath the service, you can really see that it affects the cross-sections of America. ABDULLAH SHIHIPAR: Right. So there’s, like, I think, the two most prevalent—the two most potent examples of this are Washington, D.C., and Puerto Rico. Washington, D.C., advocates have complained that their Health Department has not been as forthcoming or not has been as fast in terms of getting services available, like naloxone distribution—naloxone being the drug that can bring someone back from an overdose. But really, the most egregious case is happening in Puerto Rico, where we can only—where, before Hurricane Maria, I think numbers suggested that there were about 300 fentanyl-related overdoses and about 60 related deaths. So, that was, like, before September 2017. Since then, we have no real numbers, but advocates on the ground say that the crisis has gotten worse, and there has been no state response. Unlike most places in the continental United States, naloxone is not legal for nonmedical personnel to use, although some advocates on the ground are using it to treat overdose. And there haven’t been any federal dollars allocated for any sort of response in Puerto Rico. So, really, Puerto Rico, there isn’t any—we’re not even surveilling the problem, so there isn’t any data to suggest how bad the problem is. But by all on-the-ground reports, it’s quite bad. AMY GOODMAN: —that you’re from Toronto—you’re now a graduate student at Brown University—where, you say, the opioid epidemic is as large. ABDULLAH SHIHIPAR: Right. Right, yeah. And so, in Toronto, the opioid crisis is quite severe. In Canada—and people are continuing to die from overdose. 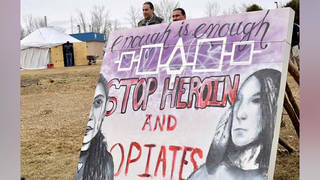 In Canada, Canada has taken some steps, more positive steps than the United States have, in the sense that they do have safe consumption sites, which are basically places where people can go to use drugs in a safe way, and someone is there to respond if they overdose. However, those sites, you know, they’re not funded enough. We don’t have nearly enough. And governments have—like the Ontario, the right-wing Ford government—have attempted to restrict their actions. So, Canada is taking—is ahead of the United States in terms of its response, but there is much left to do. ABDULLAH SHIHIPAR: Right. And so, I talked in the piece about how, specifically in South Dakota, a bunch of Native American tribes have been—have launched a lawsuit against a bunch of pharmaceutical companies. But, actually, in December, the CDC released a report about overdose deaths in Washington state in which they released new numbers that accounted for misclassification of race. And they said that they speculated that misclassification of Native American deaths has resulted in a 40 percent previous underestimation of their deaths. So, that seems to suggest that, you know, rates of, like, Native American, perhaps even other people, multiracial, Hispanic people, could even be higher, if misclassification is an issue.